You know the story… Cinderella (Lily James) a beautiful, mistreated girl is about to miss the ball due to her evil stepmother and nasty stepsisters. 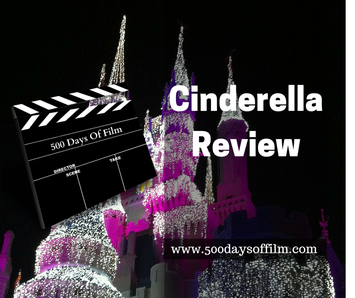 All looks lost until her fairy godmother (Helena Bonham Carter) pitches up and - bibbidi bobbidi boom - off Cinderella goes to spend a magical night dancing with a handsome, eligible prince. But the magic only lasts until midnight and Cinderella scarpers before the Prince knows who she is or where she is from. The only clue he has is one of her crystal slippers. Undeterred, he decides to search the land until he finds the girl whose foot fits the slipper. He will then ask for her hand in marriage. I have seen Kenneth Branagh's Cinderella twice - both times at the cinema. And I am pretty sure that I will be seeing it again on DVD soon. I think that, in itself, answers the question above. Yes, this film is good - very good. Come on Jane, pull yourself together. Is this the same person who watched The Raid last night? It's just that, sometimes, you need to give yourself permission to be swept away by the gorgeousness - don't you think? We have become used to films that spin traditional stories to tell different tales. Maleficent is one example (a film I also love). Not so here. The story is the one we all know and that feels like the right decision. Now, I have to admit that Cinderella is not my favourite princess - I prefer them a bit more feisty myself. However, she did not annoy me here. She seems more in control of her own destiny than usual and she has an important message - that we should have courage and be kind. Of course, the film has been criticized for another, more worrying, message: have courage, be kind and display the world’s tiniest waist. It is true, Lily James is extremely slim. However, she doesn’t (to me at least) look ill or skeletal. Would I have preferred her to have a more realistic frame? Absolutely. Does my daughter now think that Cinderella gets her happy ever after because she's thin? Definitely not. The original message of courage and kindness stands firm. Of course, Cinderella’s stepmother would disagree with this message and Cate Blanchett plays her beautifully. Her outfits are fabulous and she steals every scene. Wicked as she is, she also has depth - you understand her motivation and her desperation. All in all, Cinderella is a wonderful modern classic and will undoubtedly do very good business once released on DVD. Just thought I would mention that the first half of Cinderella is actually quite sad - lots of grief and loss. This is usually in the background of the story but it is front and centre here. The nine year olds I was with seemed a little taken aback by the deaths - but they were not particularly upset. Have you seen Cinderella? Did you love it or was it a let down. Whatever your view, let me know in the comments section below!